To view 2 more pictures, interactive maps and the full, detailed description of the Mathew's Green community, please Login. New construction properties are made according to the highest builder standards at Mathew’s Green. 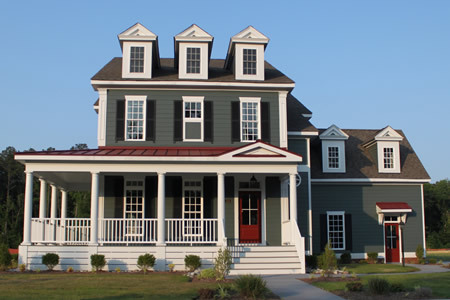 This development encompasses class and simplicity in every new home design. Perfectly positioned in southern Virginia Beach, VA, these houses allow owners easy commutes to the Virginia Beach Municipal Complex and military bases like NAS Oceana and Joint Expeditionary Base Little Creek-Fort Story. The builder of this new construction community has set the bar high. These properties are sure to impress homebuyers and guests for years to come. A new home in Mathew’s Green may include custom exterior lighting, 10-foot ceilings, brushed nickel Schlage door hardware, crown molding, ceramic tile flooring, ceiling fans with lights, hardwood flooring, custom Merrilat cabinetry, stainless steel appliances, granite kitchen countertops, Trane dual-zone heating and cooling system, fireplace with switch and much more. A special feature of this new construction neighborhood is that residents can access a preserved piece of land. The builder made sure to incorporate the natural scenery into the development and this was an integral process that contributed to the overall beauty. Several of the properties within Mathew’s Green allow views into this wild wonderland that is a haven for birds and small animals. Residents can also walk through trails to get an even better look. How can you be in two places at once? Live in this new construction complex in Hampton Roads! Lucky residents are within walking distance to the many shops and eateries of Red Mill Commons. Golfers can test their skills on the course at Virginia Beach National Golf Club. Swim, surf, windsurf and lay in the sun at Sandbridge Beach. For those who want to live in the city, the beach and the backwoods all at the same time, try the properties at Mathew’s Green on for size. The builder made these homes to appeal the city dwellers who want to be close to nature without roughing it and he did just that. Send me more information about the Mathew's Green new home community.